A joint initiative by BCM Institute and the Singapore Workforce Development Agency (WDA). This is the second in a three-part series WSQ BCM workshops and a follow up to the BCM-310 module. This module in turn, focusses on developing business continuity strategies and plans. 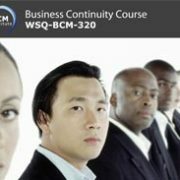 Participants who complete the three part series will be able to achieve a Business Continuity Certified Specialist (BCCS) certification*.